Want a hassle-free way to enroll your customers in your rewards program? With over 800,000 users and 800 merchants, Philippine-based startup ZAP has been helping small and medium enterprises (SMEs) to better retain and engage their customers by enabling through a rewards program that doesn’t hassle customers with a loyalty card or an app. Instead of requiring customers to download an app, merchants simply ask customers to enter their mobile number on the merchant-branded tablet to earn points. For example, if a customer spent Php200 at Chatime and got 20 Chatime Points (10 percent CashBack), the customer can then use the points as cash (one point = one peso) for future purchases from any Chatime outlet. Of course, merchants can also design their own mechanics for redemption of the points. For the merchants, this white label customized loyalty program also enables them to see valuable customer data such as age, birthday, gender, city, name, email and spending patterns. ZAP then uses this data to automatically reach out to all non-returning customers with personalized SMS messages after a set period of time. All merchants need is an Android tablet and an internet connection to get started. 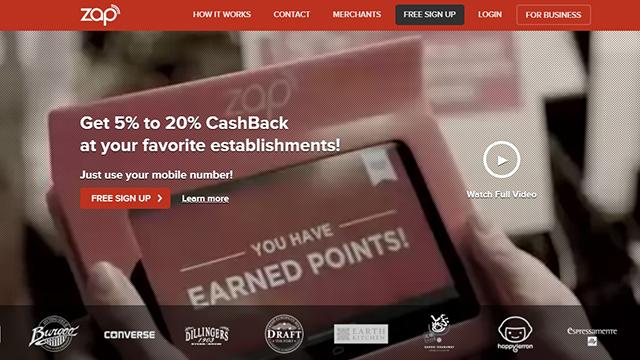 This rewards scheme has been more successful compared to their previous business model, where customers can redeem points across different brands, according to ZAP CEO and co-founder Dustin Cheng. “At the start, we were thinking of the end user first. 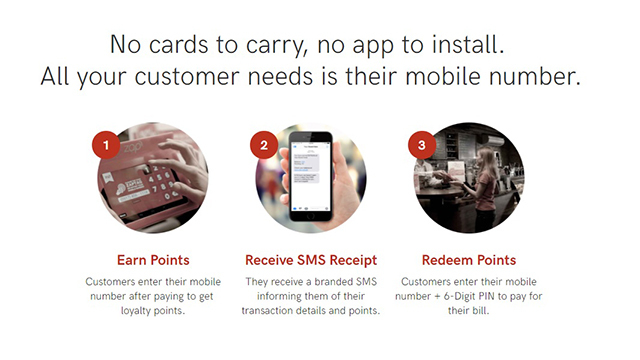 As an end user, you'd want your points to be redeemable across thousands of places. However, the end user was not our client—the merchant was,” Cheng said. With their previous business model, they discovered that the merchant did not want to promote a third-party program that was not their own. They also did not see a coalition program as something that provided them with loyalty. Customers ended up redeeming the points at a different merchant. It was more loyalty towards the coalition rather than to their brand in particular, he noted. “We listened to the customers who were actually paying merchants and gave them a branded program they could call their own. They get all the data and since it's theirs, they push it more,” Cheng said. After this pivot in mid-2015, they saw a rise in merchant usage by up to 2,000 percent. The customers were also happy since they simply have to provide their mobile number to earn points. Cheng claims his “white label” mobile number-based approach is what separates their startup from the other companies working in the loyalty space. “We are unique in that customers can use just their mobile number across all our merchants, instead of needing to download an app for each brand,” he reiterated. Cheng said that the startup plans to use its recently raised funds to grow its sales and product team, and to make a push into the payments space. “We’ve always seen loyalty as just the first step towards a larger goal—payments. We believe that payments alone will not drive consumer adoption and that loyalty plus payments presents a stronger overall value proposition to merchants and consumers alike,” he said. And ZAP is taking a step towards that goal, thanks to their investors. In 2017, they raised $550,000 in funding from investors, including Venture Capital Holdings Inc. and Kickstart Ventures. The latest funding adds to the $850,000 raised from a previous round. With a total funding of $1.4 million, ZAP is one of the top 10 most funded startups in the Philippines. According to Cheng, 2018 will be an interesting year not just for the rewards industry, but also in the payments sector.